Welcome to Fresh Ideas, the soft furnishing experts within Warwickshire. We offer a vast array of curtains, blinds & carpets coupled with a measuring & fitting service within Leamington Spa. If you’re looking to spruce up your home décor or start afresh in a new home, then you’ve come to the right place. With many leading designer brands of curtain fabric materials and wallpapers, you’re sure to find something suitable. We also have extensive ranges of wallpapers, curtains poles & patio awnings. We aim to provide a complete service where you can furnish your home, whether it be one room or a whole house without having to go from shop-to-shop. We offer a sample loan service where you can view the samples at home to check that they’re suitable. To make the experience as smooth as possible, we can also offer carpet uplift & furniture moving service. Our made to measure curtains are manufactured by our experienced seamstresses in-house, so we can ensure that the finish of your curtains & blinds are perfect every time. 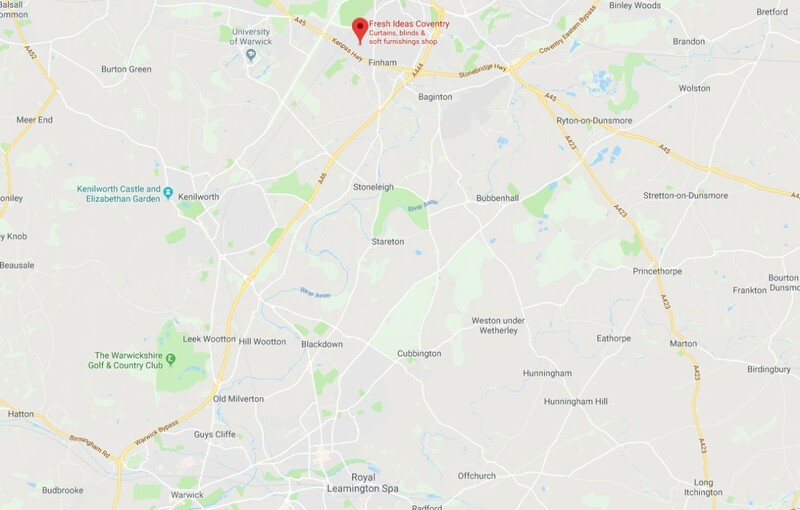 We’re only a short distance away in Coventry, where we have free parking in front of our showroom, our friendly team await you.